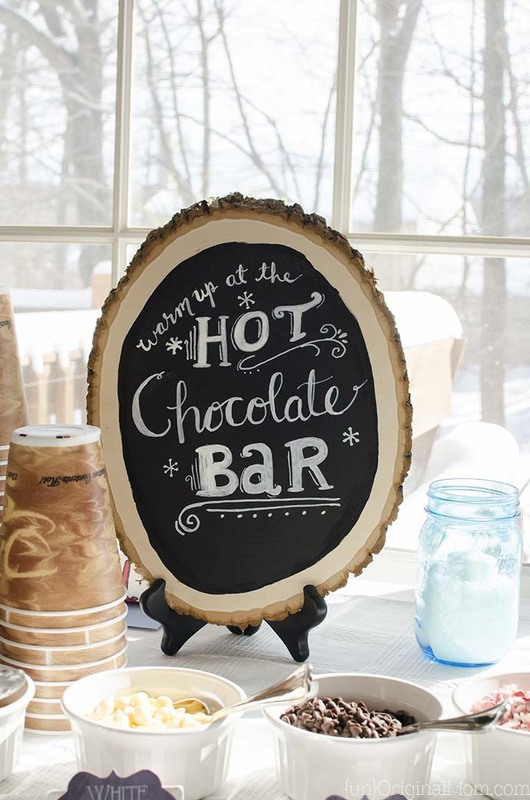 Many of the elements I created for his Winter Onederland party would work for other wintery party themes – like “Baby it’s Cold Outside” or “It’s *Snow* Much Fun to be One.” Basically, anything snowy goes! I cranked out a TON of snowflakes on my Silhouette machine. 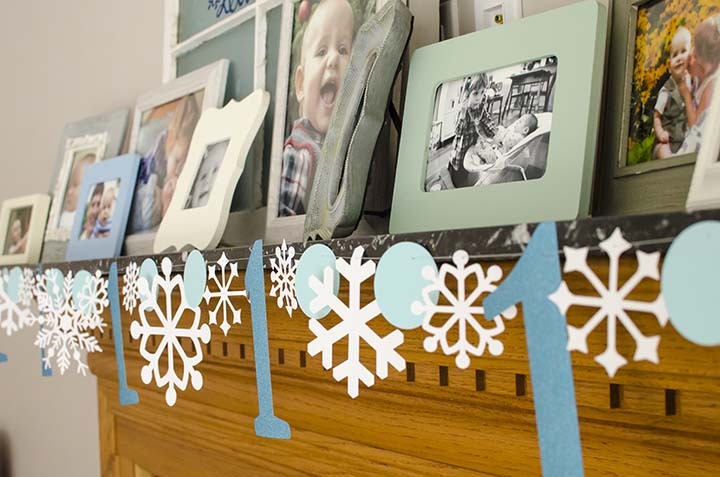 If you don’t have a Silhouette, regular old paper snowflakes would be beautiful for a Winter Onerland party! 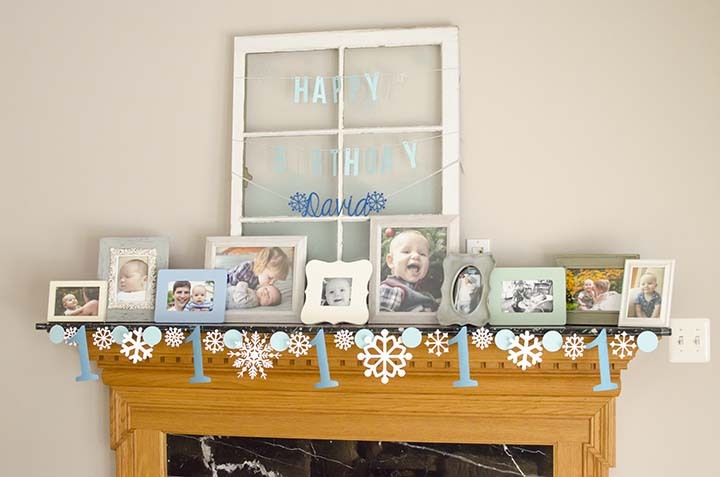 But gosh, am I glad I didn’t have to cut all these out by hand ;-) I printed a bunch of photos to put in a collection of frames on the mantel, added some frosted vinyl snowflakes to an antique window frame, and made a quick “Happy Birthday” banner out of card stock to hang on the window. No time to make decorations? Amazon has a ton of pretty winter wonderland decorations! I had even more photos that I wanted to display (because, really – you can never have enough baby photos at a 1st birthday party!) so I strung them up with mini clothespins on some twine, alternating with more snowflakes. I also hung snowflakes from the light fixtures above our kitchen peninsula and the chandelier above the dining room table. 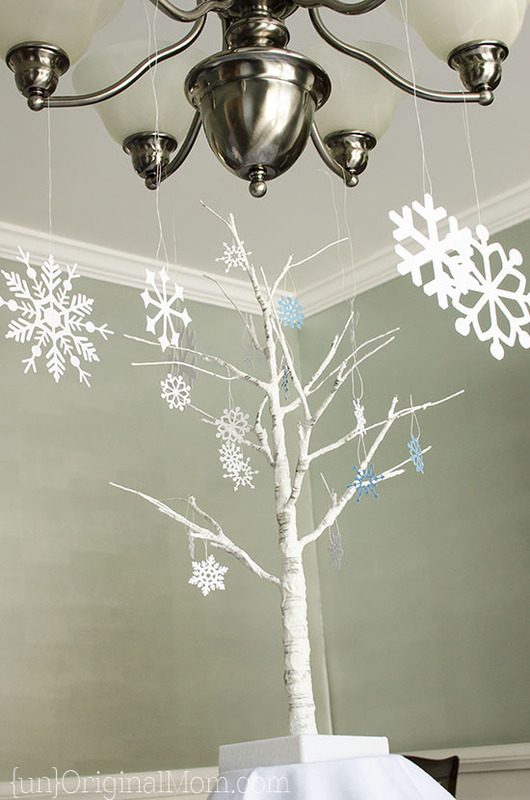 I had a little light-up birch tree in our Christmas decor that I used for a centerpiece on the dining room table…with, you guessed it, more snowflakes! 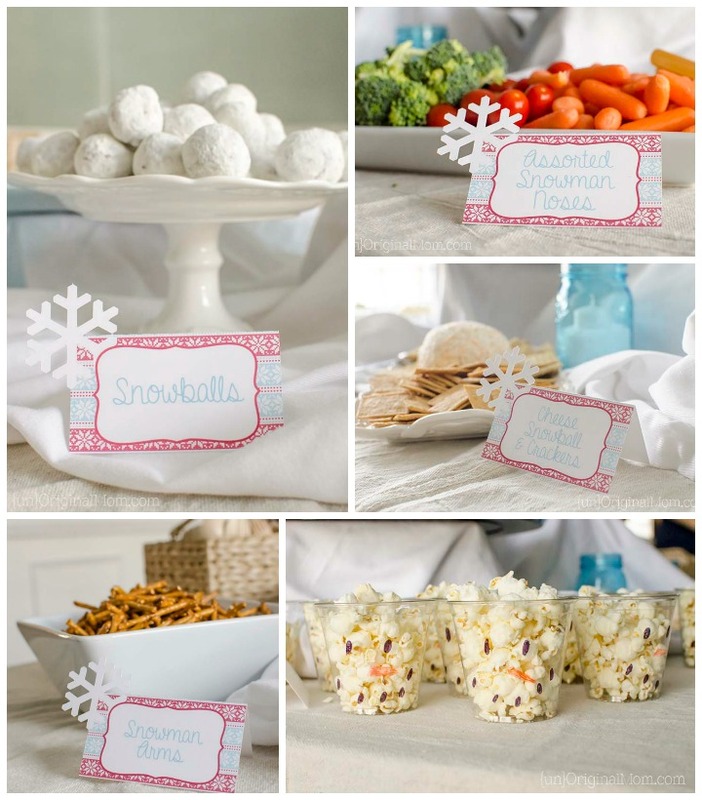 I scoured Pinterest for ideas and ended up with a really fun – and fairly easy – spread of food! It was a lunchtime party so we got subs (“cold cuts”) and served them with some other munchies, like “assorted snowman noses” (carrots and other veggies,) “snowman arms” (pretzel sticks), popcorn in clear cups with snowman faces drawn on them, a cheese “snow”ball and crackers, powdered sugar donut holes, and “pigs keeping warm in blankets.” “Fruit infused melted snow” was the main beverage on hand (water with orange, lemon, and lime slices). I used my Silhouette to design, print, and cut the food tags. 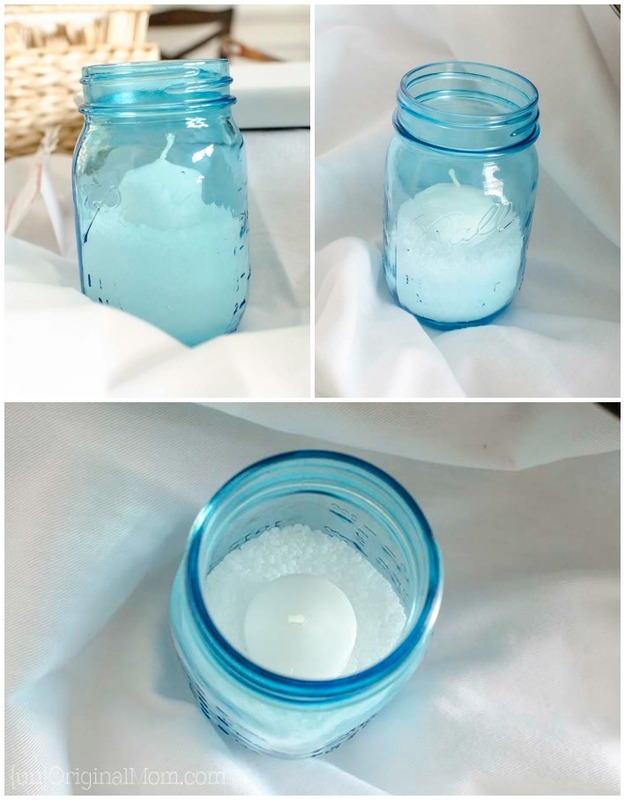 Probably the easiest decor were these pretty little mason jar candles. I found the vintage blue mason jars at Target (find them on Amazon here), filled them with some epsom salt, and added a votive candle. Presto, “snow” candles! Don’t feel like DIY-ing a sign? 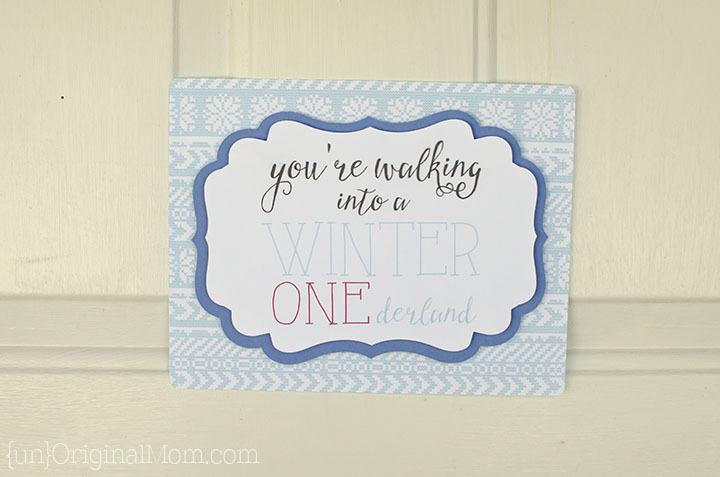 Search for a free printable on Pinterest, or buy a ready made one on Amazon here. 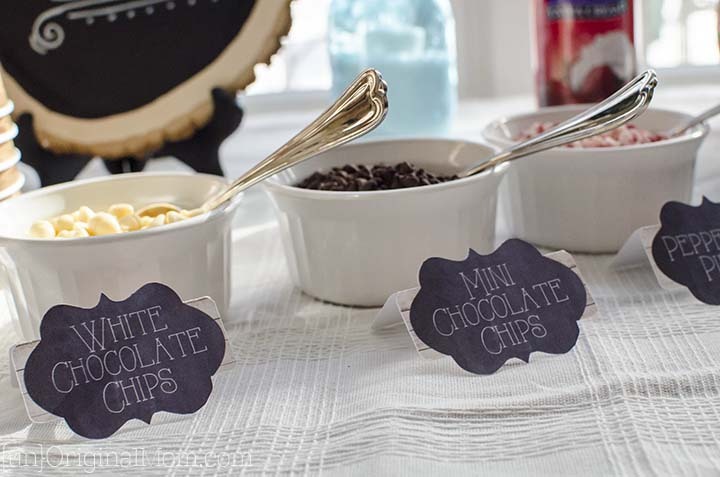 We had all kinds of yummy toppings for the hot chocolate bar – mini chocolate chips, white chocolate chips, butterscotch chips, peppermint chips, mini marshmallows, caramel sauce, cookie sticks, and whipped cream. I used the recipe on the side of Hershey’s Cocoa Powder – it makes THE best hot chocolate. Happy birthday, sweet boy! You are very loved!! Get your copy of my FREE meal planning binder! Sign up to get a free copy of my meal planning system - an 11 page printable meal planning binder, complete with a pantry inventory, shopping list, and more to help get on top of your menu each week! 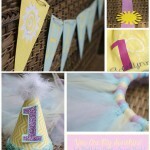 You Are My Sunshine Party – Sneak Peak! 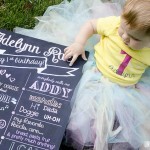 This is such a fun birthday party theme! I love the decorations, the mason jar “snow” candles are so brilliant. I could use a lot of these if my daughter still wants her Frozen themed party when we get closer. Pinned! What a beautiful party! You did a great job with all of the decorations, the snowflakes look gorgeous and so does all of it. Thanks so much, Kate!! It was fun to put together! Do you know where you got the stand to hold the wood slice sign? Thanks! Oh, I love this party theme! Winter is my favourite time of the year!? Could you please show me the recipe for the hot chocolate? This is a wonderful idea for my next birthday party! Thank you so much for your nice and cute ideas! 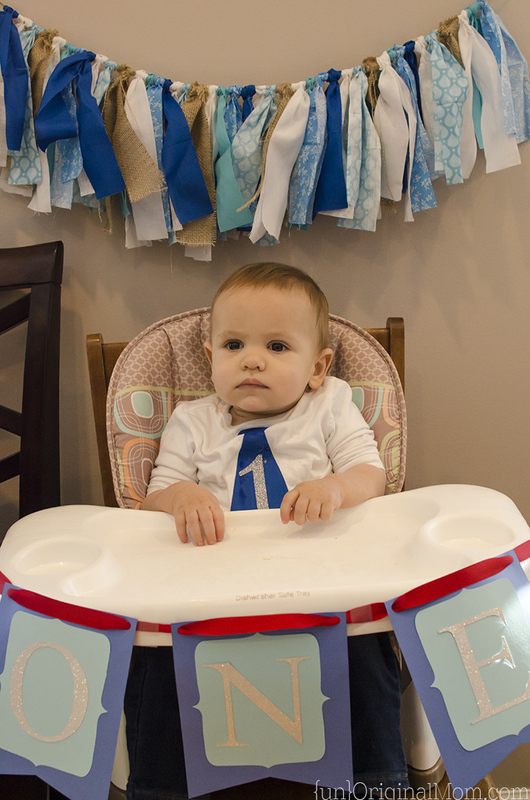 Just discovered this fun theme today while searching for ideas for my baby boy’s first birthday in December. His sister was born in June 2014 and the theme for her party was Sunshine too!!! I too love the contrast. Thanks for sharing your ideas! stay-at-home mom to three beautiful children, wife to an incredible husband, and daughter of a loving God. I freely admit that I am not always the most creative or original person when it comes to crafting, decorating, organizing, cooking, etc...but I love being inspired by great ideas and putting my own spin on them! Look around, stay a while, and I hope through my *unoriginality* I can provide some inspiration to you, too! 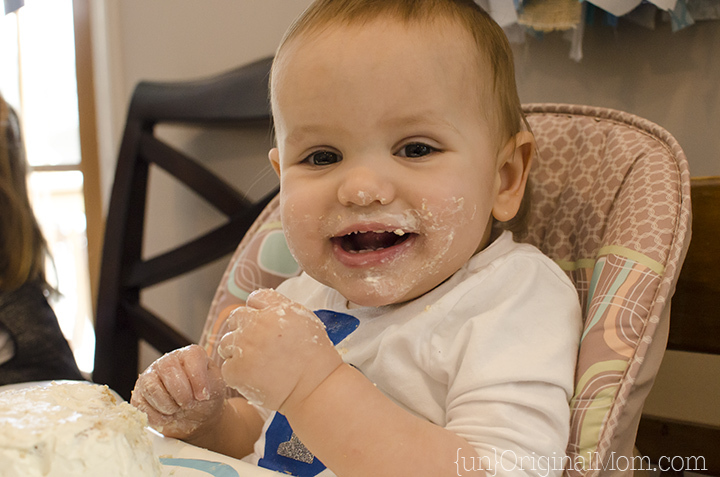 Unless otherwise stated, all words and photos on this blog are my own and are copyrighted by unOriginal Mom. 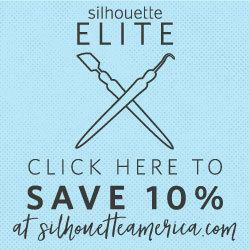 If you'd like, you may use 1 (ONE) photo, without altering them in any way, including removing the watermark, but you must attribute proper credit and a link back to this site. I would also appreciate a comment letting me know so I can visit! 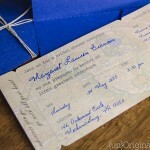 The text of this blog or multiple photos should NOT be copied and re-posted elsewhere without permission.